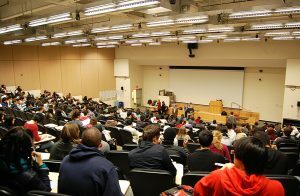 The Black Sheep recently published an article entitled “How Every BU College Can Win Over Their Professors.” It is a very funny article and I recommend you read it. You’ll notice in the College of Communication section that the best way to get an A in COM is to never stop talking in class. There is a reference to someone named “Tinder Dan” who really doesn’t know how to shut up. Hi, I am Daniel Anthony Dellechiaie or as some people in my CO101 class know me, “Tinder Dan.” The story behind that nickname is worth telling, unless you were in my COM class, then you know the reason. The main purpose of the Black Sheep article was to joke about the students of the colleges at BU. As I read it, I thought about my fellow classmates and laughed. We all know that friend of ours in Kilachand who knows so many thinkers’ ideas that he doesn’t have time to think of his own or that chainsmoker in the uniform navy blue suit and black wingtips. I found it hysterical that my first reference in an article was to make fun of my biggest “flaw,” that I talk too much in class. Everyone who has class with me knows I don’t know how to shut up. They all share collective eye rolls when they see the teacher calling on me for the third time in a single class period. But sadly, no one ever asks why do I talk too much in class. I think that is worth knowing. I took a class in high school in which I learned about Socratic circles. If you are a College of Arts and Sciences student, you never stop talking about them. I thought I talked a lot, but you people really know how to take the things you read in class and make sure no one else wants to read them. You guys know how to turn a topic from being discussed ad infinitum into ad nauseam. Anyway, Socratic circles basically turn a class into a space for lively discussion. At BU, instead of speaking in Athens surrounded with marble structures, we have concrete classrooms in which there is always construction going on outside. Socratic circles aren’t arenas to see who can outdo each other but rather a learning experience for the entire class. I hate lectures in which you have to sit there wondering if the lesson is going to outlast your will to live. I have noticed that most of the people that respond in class either want to talk about how this lesson related to their latest internship or want to show people that they know how to use words such as obfuscate, egregious or acumen. I talk too much in class because I want to get a conversation started. I want someone to agree or disagree with me so others can learn from it. However what ends up happening a lot of the time is that the other students do not care enough about the class, or just want the teacher to get on with the lesson so they can learn what they need to and go back to their dorms. My constant responses are little gadflies buzzing around them. The reason I talk a lot is not because I want to rack up those 20 participation points or that I want everyone to know that I have read Wittgenstein and that this somehow makes me better than people, but rather because I want people to learn. You aren’t going to learn just by sitting there absorbing information. You need to be actively involved in your education, whether that means asking a question or talking too much in class. I never want to take up all the talking space in the lecture hall. I don’t like hearing myself speak too much either. But someone has to stop me and people like me from “hogging the mike” by joining the discussion. The next time some guy raises his hand after every question, raise your hand. Create a dialogue. Do not let a class become an echo chamber for the guy who never shuts up. He doesn’t want to hear himself talk too much either. Holy crap. This post couldn’t be more relevant to one of my current classes. We are about 6 weeks into the semester and I feel like it is just a conversation between the professor and me. I have become self-conscious about the amount I’ve been speaking in class but I also do not want to talk for the sake of talking or feel, just like you, that I am in an echo chamber of my own thoughts (especially since the professor and I agree on a lot of topics). I mostly speak up and talk because I want to be proactive in my education and engaged with the material. However, the class is just dead and no one takes initiative to start conversation or bring their voice into the room. I seriously hate having to be the guy to clear the silence. I let like 20 or 30 seconds go by sometimes just to provide opportunities for others to speak but then I look around and see everyone disengaged on their laptops. Naturally, I raise my hand and give a response because I’m actually very interested in the subject and I want to bounce thoughts with others in my class and the professor. Maybe even collaborate and take the discussion somewhere deeper and make it relevant to our lives or current events. I just feel at this point I want to shut up now and let the awkward silences continue and leave my voice out of the room. It’s a little sad that people spend pretty pennies to attend universities and can’t unplug for an hour and a half lecture to actually be present. You don’t need to be a Chatty Cathy but bring your voice into the room and bring it early. Please talk because I swear I’d much rather be the person listening to another person’s opinion that is different than my own and learn something instead of just doubling-down on my own thoughts and beliefs. On the other side of the coin I won’t sit idly by and let lecture descend into a boring and awkwardly silent “death-by-PowerPoint”, one-sided discussion when I have a voice and I’m there to learn.